Now that the cherry blossoms have officially started blooming in Japan, the sakura-themed goods are flying off shelves as people stock their picnic baskets in preparation for this year’s hanami season. One of the most popular and surprising finds is the limited-edition release: Sakura Japanese Sake KitKats. The new chocolates come in a beautiful package, featuring images of sakura blooms and petals, a pink-hued bottle of sake, and a Japanese castle floating on a sea of gorgeous blooms. Like their past sake KitKats, these ones contain 0.07 percent alcohol content, making them unsuitable for children or people with a weak tolerance to alcohol. Fortunately the reporters of SoraNews24 are neither, so they picked up a multi-pack of 12 mini bars, and when they opened them up, they found each one was individually wrapped, and adorned with an image of cherry blossoms falling towards a glass of sake on the front. They ripped into one, and were immediately hit with the familiar aroma of sakura. It was surprisingly strong, and had them instantly curious to find out what this beautiful pink KitKat would taste like. As soon as they took a bite, their eyes grew wide as they tried to take in everything that was happening to their taste buds. The floral, slightly sour sakura took over straight away! But then, there was a hit of alcohol—and not just any alcohol, but the rich, familiar flavor of Japanese sake. Each bite came with a dizzying swirl of intense sakura and sake flavor, which hit in alternating waves as the floral ingredient filled their noses and taste buds with its intense aromatics, while the distinct bite of rice wine played out in between it all. 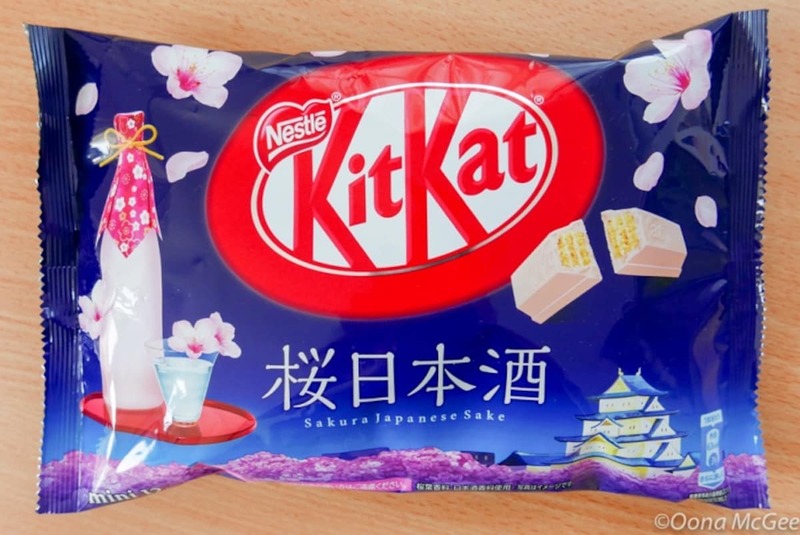 According to the notes on the package, the Japanese sake in these KitKats has been blended into the white chocolate coating, while a sakura-leaf cream fills the inner wafers, which helps to create a well-crafted balance between the two intense flavors. This is definitely one of the most unique Japanese KitKats they've tried to date, so if you see them at the store, be sure to pick them up and give them a try. They’re the perfect addition to any hanami picnic, and will enhance your time under the blooms, no matter which one of these top cherry blossom spots you decide to visit! Read the original article from SoraNews24 at the link below!